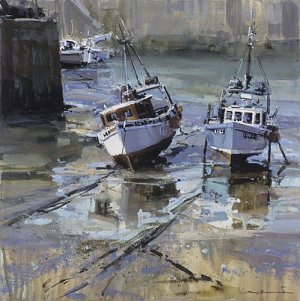 The painting was made over many months at his studio, a former lifeboat station, in Newquay. An accompanying four minute film documenting the making of the work and featuring local people from north Cornwall posing as models, can be seen at http://www.nicholascharleswilliams.co.uk. Williams has exhibited widely, with solo shows at the Russell-Cotes Museum & Art Gallery, Bournemouth; Royal Cornwall Museum, Truro, St Mary’s Cathedral, Edinburgh and Liverpool Cathedral for the opening of the European Capital of Culture. In 2001 he was awarded the Hunting Art Prize and in 2008 shortlisted for the Threadneedle Figurative Prize.